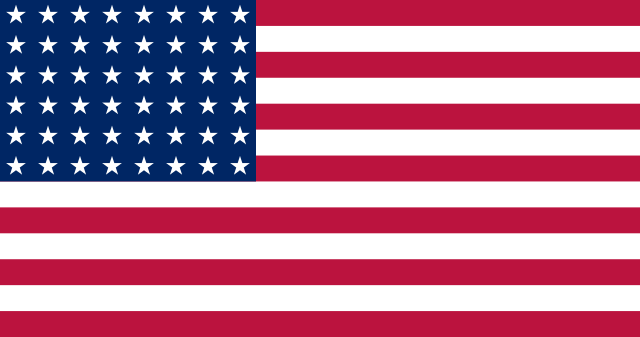 English: US Flag with 48 stars. In use for 47 years from July 4, 1912, to July 3, 1959. العربية: علم الولايات المتحدة ذو 48 نجماً، تم إعتماده رسمياً بتاريخ 4 يوليو 1912م لغاية 3 يوليو 1959م. 作者 Created by jacobolus using Adobe Illustrator. 現在の版 2019年2月28日 (木) 19:09 1,235 × 650 (1キロバイト) Sshu94 Reverted to version as of 19:16, 21 March 2013 (UTC) The diameter of the stars is about 80 percent of the width of the individual stripes according to the tables in the construction sheet. The stars on the current version are too large. 2011年1月15日 (土) 19:00 1,900 × 1,000 (9キロバイト) Zscout370 Some of the measurements were off.